This fan had little time to react when a foul ball headed in her direction. After another fan was injured at a Major League Baseball game, some players are calling for action. 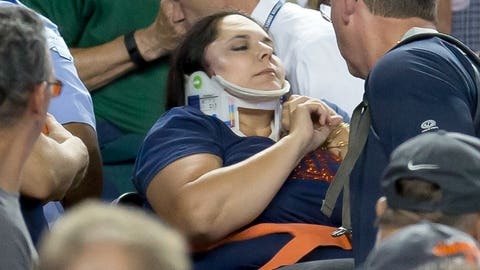 In the eighth inning of the Texas Rangers-Detroit Tigers game at Comerica Park on Friday, a fan sitting behind the Tigers dugout was hit by a foul ball and taken away strapped to a chair with a neck brace. She was hospitalized, and the Tigers announced after the game that she was alert and conscious. On Saturday afternoon, she was released from the hospital, according to the Tigers. More protective measures need to be put in place in all ball parks! Players are sick of seeing injuries that could easily be avoided! Tigers manager Brad Ausmus seconded those statements. "I think the fan safety is a growing concern," he told the Detroit Free Press. "It’s not really my call, but I do think it’s something that should be looked at." Tigers third baseman Nick Castellanos is in favor of protective nets that run to the end of the dugouts: "There’s no way that lady could have reacted to (Anthony) Gose’s line drive. … The safety of the fans is more important. I’m praying that that lady is OK and I know that she wishes that a net was up tonight." This wasn’t the first such incident in the majors this season. In the scariest case, a fan at Fenway Park was hospitalized with life-threatening injuries after being struck by a piece of a shattered bat in early June. During the All-Star break last month, Commissioner Rob Manfred said MLB is evaluating ballpark safety features but that no changes – if any are to come at all – will happen before next season.